The Government’s Chancellor of the Exchequer, Philip Hammond MP, has today set out his autumn 2018 budget and confirmed that he will inject an “additional” £200m+ to help “full fibre” broadband ISP networks reach rural areas. He also set out policy proposals to encourage FTTP for new build homes and existing apartments. A number of significant policy changes and improvements have occurred since the last budget and thus it’s necessary to highlight these in order to give the proper context for today’s speech. The primary change has been the Government’s commitment to deliver ultrafast Gigabit capable “full fibre” (FTTP/H) broadband ISP connections to 15 million UK premises by 2025 and an aspiration for universal coverage by 2033 (here). Not long after that they also published the Future Telecoms Infrastructure Review (FTIR), which set out what changes needed to be made in order to facilitate their future “full fibre” and 5G mobile plans. Ofcom immediately followed this up with a related consultation on the necessary regulation changes (here). The FTIR report suggested that it could be commercially viable for two or more ISPs to invest and deploy FTTP/H networks for the first 80% of UK premises (Ofcom use a more realistic figure of 60%), provided its changes were adopted to encourage investment. After that it noted that the next 10% might be able to support a commercial roll-out, albeit only from one operator, while the final 10% could require up to £5bn of public funding (likely to be match-funded with private investment etc.). NOTE: The FTIR stated that the total level of investment required for the national roll-out of full fibre is estimated to be in the region of £30 billion, although it’s unclear whether this factors in all of the fibre that has already been laid by existing operators (e.g. as part of hybrid fibre FTTC services). Furthermore the report said that public investment in full fibre for rural areas should begin “simultaneously” with commercial investment in urban locations, but so far there’s only been a comparatively small commitment (c.£200m) and that stems from the existing Broadband Delivery UK (BDUK) scheme. 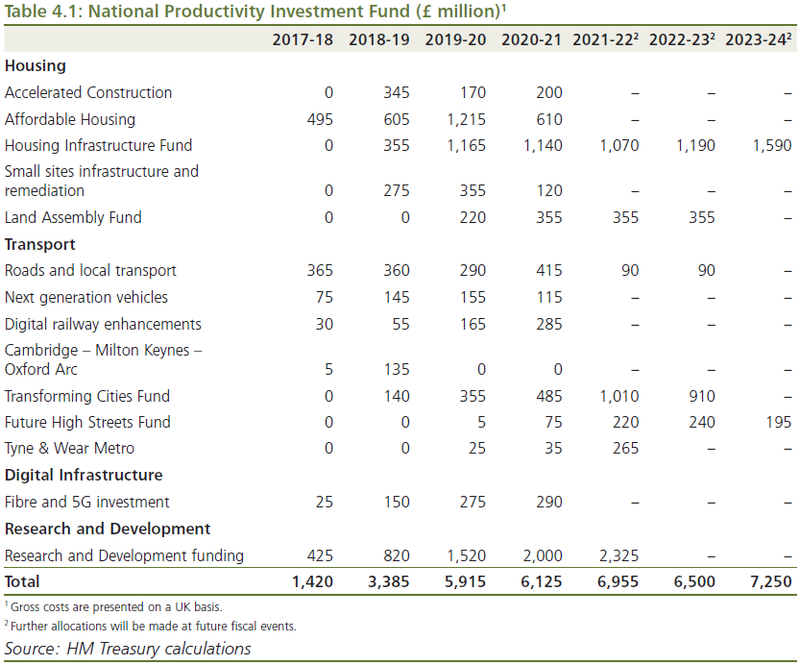 One thing is thus abundantly clear from all this, significantly more funding for rural areas would be needed to turn the 2033 aspiration into a viable target, particularly since we’re talking about a MASSIVE civil engineering ramp-up (i.e. adding around 2 million additional FTTP premises to the national coverage every year for the next decade or more). At present we’re a long way from that and finding enough skilled engineers is difficult. Suffice to say, all eyes were fixed on today’s budget to see whether such a huge commitment of additional public funding might be made. On Sunday it was reported that “at least” £250m of that £770m total could be put toward helping to fibre-up more schools, libraries and other publicly-owned buildings in digitally disadvantaged areas (e.g. remote rural communities), although today’s announcement pegged the figure a little lower. • The Budget allocates £200 million from the NPIF to pilot innovative approaches to deploying full fibre internet in rural locations, starting with primary schools, and with a voucher scheme for homes and businesses nearby. The first wave of this will include the Borderlands, Cornwall, and the Welsh Valleys. • Alongside the Budget, the government is publishing consultations to mandate gigabit‑capable connections to new build homes and speed up the delivery of upgraded connections to tenants, making it quicker and easier for communications providers to roll out full fibre networks. • The government is also announcing that Suffolk is the first local area to be awarded £5.9 million of funding from the third wave of the Local Full Fibre Networks challenge fund, enabling next-generation full fibre connections to key public buildings. The proposed approach sounds like an extension of the existing £200m Local Full Fibre Network (LFFN) challenge fund, albeit one with a more specific focus on rural areas. The idea is that once key public sites (“hubs“) have been connected then the network could also be harnessed by ISPs to extend 1Gbps FTTP out to reach local homes and businesses. This in turn would help to make the FTIR ambitions more viable. Likewise the new consultations (here and here) for helping to mandate gigabit‑capable broadband connections to new build homes had effectively already been announced as part of the earlier FTIR proposals, although we do get a little more detail on the core proposals for this. * Amending the Electronic Communications Code to place an obligation on landlords to facilitate the deployment of digital infrastructure when they receive a request from their tenants. * Enabling communications providers to use magistrates courts to gain entry to properties where a landlord fails to respond to requests for improved or new digital infrastructure. * Developers and network operators share the cost of connecting new build sites to gigabit-capable networks. 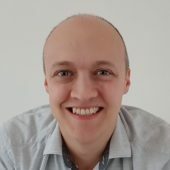 * Introducing a ‘duty to connect’ provision upon network operators. * Amending Building Regulations Approved Document Part R: (Physical infrastructure for high-speed electronic communications networks). This will mean all new build sites will be built with the necessary infrastructure in place to support gigabit-capable networks. However we should point out that the official Budget 2018 Document reveals that the Government’s allocation for Fibre and 5G, which comes under their multi-billion National Productivity Investment Fund (NPIF), remains unchanged from the last 2017 budget. In fairness, it was probably a bit too soon for the Government to set out funding for the 2033 target, particularly since their plans could easily be impacted by whatever Scotland, N.Ireland and Wales end up doing on the deployment side of their own plans to achieve as close to universal coverage of “superfast broadband” (30Mbps+) as possible (here, here and here). Likewise even the 10Mbps+ USO policy may have a small part to play. Lest we forget the as yet unknown quantity that is the pantomime of Brexit negotiations and future trade deals with the EU. So far the Government appears to be playing a cautious game by leaving commercial operators to do their own work for a few years (albeit with some limited financial assistance / incentives and policy tweaks), before perhaps stepping in much later to help connect the last bit, much like they did with BDUK. On the other hand if the Government seriously want to achieve the 2033 goal then they may need to act sooner rather than later, particularly if they truly want rural FTTP/H coverage to keep pace with urban areas (very difficult to do). Alternatively the 2033 aspiration could just be a useful political football, which may remain unfunded so that a different government of the future can have the headache of sorting it all out. Overall today’s investment boost is a drop in the ocean of what digitally disadvantaged areas (e.g. rural communities) might eventually need. Furthermore it doesn’t change the fact that deploying FTTP out to individual premises remains both hugely time consuming and expensive, although bringing fibre into the community and expanding the availability of vouchers is most welcome (as yet we don’t know exactly how these will differ from the existing Gigabit Voucher Scheme). We should point out that some operators (e.g. Openreach) have already installed fibre optic cables either close to or all the way into street cabinets or other buildings inside many rural communities. However, as stated above, extending those fibres out into homes is still a huge challenge and if it wasn’t then the operators would have already done it. Before we go, here’s a brief recap of what the UK Government has already pledged for broadband infrastructure since 2010 (note: between 2010 and 2015 it was a coalition of the Conservatives and Liberal Democrats). * The £1.6bn+ Broadband Delivery UK programme is working to put fixed line “superfast broadband” (24Mbps+) networks within reach of around 98% of premises by the end of 2020 (currently nearly 96%). Openreach (BT) hold most of the contracts but a few AltNets are also involved in the later stages (Gigaclear, Call Flow, Airband etc.). The most recent contracts target a slightly faster speed of 30Mbps+. * The proposal for a legally-binding Universal Service Obligation (USO) for broadband, which would offer a 10Mbps minimum download speed to all – upon request – from 2020 (1Mbps upload). 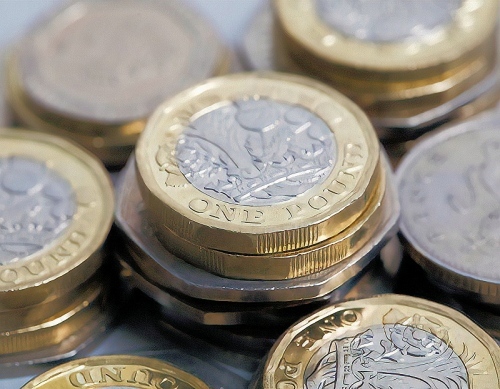 * £400m has been provided to a Digital Infrastructure Investment Fund (here), which must be matched by private finance, to help invest in new “full fibre” (FTTP/B) networks over the next 3 years (focused on helping to boost altnet providers). It’s hoped that this could foster FTTH/P capable connections for an extra 2 million premises by 2020. * £200m has been set aside to support the Local Full Fibre Networks (LFFN) scheme (details, here, here and here), which is funding a programme of local projects to test ways to accelerate market delivery of new “full fibre” broadband networks (e.g. connection vouchers for businesses, aggregated demand schemes, opening access to existing public sector infrastructure). * 100% business rates relief for new full-fibre infrastructure, backdated for a 5 year period from 1st April 2017, but the advantages of this may be neutralised by the government’s hike in existing rates (here). In order to be truly effective the government may need to extend this but so far they’ve seemed reluctant. * Providing funding to support a programme of 5G trials and future spectrum release. The first large-scale commercial 5G roll-outs aren’t expected to begin until 2020 but some smaller deployments may start in 2019. * Various local voucher / subsidy schemes are still on-going to help those areas that suffer slow broadband speeds. * Ofcom’s Strategic Review has attempted to boost competition by making Openreach more independent from BT and giving rivals greater access to the operators national network of fibre optic cables and cable ducts/poles (here). Not to mention improving the overall quality of service and greater information sharing. * The Government are also supporting various other broadband related measures through their Digital Economy Act 2017, such as automatic compensation from ISPs for service faults (here), improved / cheaper access to build new infrastructure on private land (here) and more enhancements for consumer switching etc. * Some £75m has been assigned to help improve broadband connectivity in hard to reach areas via the RDPE’s Rural Broadband Infrastructure Scheme (here). A couple of comments have come in from the bosses of ISPs Zen Internet and urban provider Community Fibre. “Rural connectivity has always been the missing part of the puzzle. For years infrastructure investment has been driven by the need to improve connectivity in big towns and cities, and this investment will go a long way to righting that imbalance. “Given the isolating effect broadband poverty has on individuals and communities across the UK, it is encouraging to see that the Government is taking decisive steps to support the rollout of full-fibre broadband. With a greater number of vital services going online, which all demand a high-speed connection, true full-fibre broadband must be regarded as an essential utility for all parts of the UK. The Chancellor has thankfully recognised that basic internet access is simply no longer enough. However, as the majority of the connections in the UK are still copper-based, it is evident that the UK is not yet fully prepared for the digital future. Recent OFCOM research has found that the average household is doubling its data consumption every two years, be it watching online video or accessing government services, and so adequate fibre broadband is swiftly becoming vital. Some more comments have come in this morning. “Full fibre broadband is rightly being recognised as an essential utility and a key driver of regional productivity. Our research shows that almost half (46%) of people think greater access to faster broadband will boost their local area’s economy, helping businesses expand, attracting more talent and fuelling job creation, which is why it ranks as their single most-wanted infrastructure investment. “The Chancellor has prioritised connecting the countryside like never before. Digital connectivity is vital to boosting rural economic growth and this funding will go towards projects which should lead to the deployment of full fibre broadband in the hardest to reach areas. I notice the first paragraph of your conclusion talks about BDUK in the past tense. Is BDUK finished except the implementation of existing contracts? If so is there actually any money being invested directly in connecting sub-10Mbps properties at the moment? Or is it a case of waiting for 2020 for the USO, or hoping the local infrastructure schemes make a commercial rollout viable? The latter idea seems targeted at remote communities, not the properties on the fringes of more populated areas with EO lines or too far from the cabinets to get FTTC. not the properties on the fringes of more populated areas with EO lines or too far from the cabinets to get FTTC. This just nails it. You are too ‘rural’ to be economical or of concern, Unless you’re a New Build property on the edge of a populated area, then its of national concern you get good Internet and they’re going to make it mandatory you get one. Hey Even Openreach will do it for free, but you have to build a NEW house. For properties such as mine just outside a village with FTTC but on an EO line, I can’t see how the USO can help. They can’t reroute a single line from EO to a cabinet, and rerouting the bundle is too expensive (which is why Fastershire refused to let BT do it as part of the BDUK rollout). There are no wireless ISPs in the area, and FTTP would be way over the cost limit, so I suspect the only options for many via USO will be 4G or satellite. Of course, for me USO won’t be an option anyway as I’m in the Gigaclear rollout for 2020 (or at least I was a couple of weeks ago before they admitted being way behind schedule). From what you say USO isn’t meant/needed to cover you. Quite right, USO won’t cover me, unless the Gigaclear rollout in my area is abandoned (which is quite likely IMO). However, there are lots of other properties in equivalent situations that still aren’t in any rollout plans. Confused slightly here Gigaclear is a FTTP Provider why would you want to fall out of Gigaclear’s plan and fall under the USO instead? Not only would you likely have wait longer but it would also effect many other properties around you. I don’t want to fall out of Gigaclear’s rollout. I’d like them to get on and build it. However, there has been no progress in my area since they got the contract, and the target start date is now further in the future than it was two years ago. They are currently rewriting the plans, so the dates may change again – although as my area will be one of the last to be built I don’t think it will move to be sooner. The most recent date was 2020, but they won’t be able to achieve that without finding more contractors, and they now seem to be busy with other builds (Vodafone etc). Being in a “plan” means that there is no other help available – but when the plan keeps moving without any progress it isn’t much use. Yes that’s right a legal right to pay for the service, Openreach will connect many thousands of you right now if you pay for FTTPoD. I don’t need a legal right to order a product and pay for it myself. Why should some be forced to pay through the nose when the Government has funded free improvements for the vast majority using our Taxes. No they won’t. OR has stopped accepting orders for FTTPoD (again). @Tim, I just received a quote from Cerberus Networks the other day for FTTPoD at a price of £8500 + VAT (including discount for the fibre passing 1 property on the way to me), they could be being selective perhaps (I am in NI)? If BT had bothered to do a half proper survey (I appreciate there is normally a cost for this) they would actually realise that they would directly pass 37 properties on the way to me from the cabinet (4 of those come off of the final dp including me). Hmm, add those 37 into the discount pot and I should be getting it for next to nothing :). There are also about an additional 15 that would tee off another dp about half way along the run bringing the total to 52. A limited number of these will now doubt be able to receive SuperFast at the moment but none of them will be receiving pure fibre. BT’s loss? who knows. I’ve given up the fight, 6 years in the ring with BT and the NI Government (when it existed) has been long enough for me. Still not that I care anymore I now use Three for unlimited tethering and I have shoved BT’s landline up their backside. Fib doesn’t come from the cabinet (fttp/dp/b) so simply counting properties you think are on the same copper line is pointless. @Joe I was under the impression that FTTPoD used the FTTC node at the Cab and fibre was laid from there to the premises, with FTTP being different of course as this is run direct from the Exchange bypassing the Cab to the premises? Perhaps there has been a change in deployment? I was referring to FTTPoD in my comment as we are connected to an FTTC enabled Cab already but too far to receive anything reasonable that resembles FTTC (sub 2Mbps). Fttp often takes a completely different route from the copper as they are not tied to the local copper network (which often has a route that makes no modern sense!) It involves an aggregation node (at an exchange but not always yours) which travels out to splitter nodes (over poll or duct) and its from there that the fib for each individual property comes from. So while its possible that a nearby cabinet might also be a convenient location for a joint for fttp it is more likely not to be. Yes, as I already highlighted. But for FTTPoD (not FTTP) it will be? In terms of connectivity they are same. The only difference between the products AFAIK are pricing and “oD” (On Demand). As FibreFred says FttP/FttpoD have no technical differences. The easiest thing usually is go walk the local road and find the nearest manifold. In your case perhaps the nearest larger splitter node. No need for the government to waste public money on the fibre bubble. Private money is already racing to be burned. “* Amending the Electronic Communications Code to place an obligation on landlords to facilitate the deployment of digital infrastructure when they receive a request from their tenants. all part of the superfarce, this is how digitalbritain rocks. All talk, meetings, consultations and bt laughing at them as they continue to leach the copper assets. BT will keep on monopolising content and mobile, then openreach will be thrown to the dogs for government to sort out. Altnets are our only hope. I was wondering when I was going to see your anti-BT trolling. Same copy and paste Chris…. If altnets our the only hope, we are somewhat doomed. Based on the amount going to the wall over recent years and deployment speed of the ones still around. @Matthew, totally true. Adapt to survive. If you want to stay in business you need to offer more than just connectivity. @Chris Conder: It’s not that easy. While BT has indeed been an utter failure, and while it certainly was wrong to use taxpayer’s money to prop up this ailing company, it is nevertheless not that easy to spin off Openreach. Openreach has never been an independent company, and it doesn’t even own the network assets. it’s budget is controlled by BT. Hence no company or investor would invest in Openreach on a larger scale. There are some possible ways to sort out the BT mess, but that must include the network assets, and it would also need a solution for the giant pension burden. Chris doesn’t reply to the trolls. I do read them CarlT, but I smile these days and don’t wast my time any more. The same trolls who have defended fttc since 2009 and said here on this forum that 2mbps was more than fast enough for most people. This forum will be the history of the superfarce that digitalbritain has become, and the trolls will be remembered.